As I have been away and busy with work over the last few weeks and will be busy with work as I go to St Kilda for a week next week, I have been unable to tackle any gaming things. However, I have been working on a Square Bashing scenario based on the November 4 1918 crossing of the Sambre-Oise Canal. 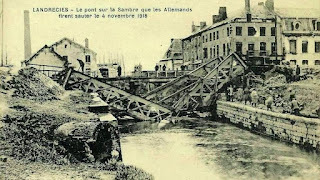 The Battle of the Sambre was the last big action of the BEF in the First World War but is generally passed over in most histories. It is largely known (if at all) for being the place where the poet Wilfred Owen was killed whilst crossing the canal at Ors. However, further investigation into the action reveals that it was one of the most important, if not THE most important, battles on the Western Front. The German defenders were destroyed in most places and their structural integrity was in tatters. Although the German High Command had discussed surrender terms in the previous days, the crossing of the canal sealed the deal. An orderly withdrawal was impossible and within a week the Great War was over. As research for this scenario, there isn't much to go on. The action is usually glossed over as part of the last 100 Days of the war. However, Niall Barr's excellent chapter on the battle in Changing War is a short but exciting account of the fighting, including descriptions of some of the seven VCs won during the assault. An even more in-depth account is John Derek Clayton's 2015 PhD thesis specifically on the battle. Read it HERE. Both were consulted as part of this scenario. 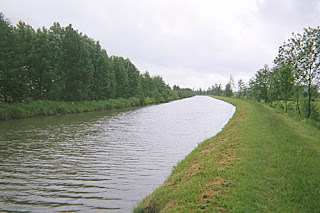 The scenario takes place where 96 Brigade & 14 Brigade (32nd Division) and 3 Brigade (1st Division) crossed the canal at Landrecies, Ors and Catillon, respectively. Below is the scenario map, north is the left of the map. The area around the canal is largely flat and open farmland, broken up by hedges, I've tried to simulate this with minimum amounts of forest. 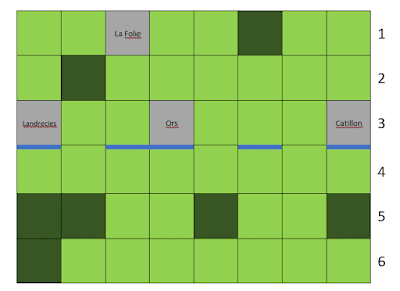 The light green squares are open, the dark green is forest, grey squares are urban areas and the blue lines are the canal itself. The canal can only be crossed at the broken sections. The Germans can set up anywhere in the rows 1,2 or 3, the British begin in row 6. The German depletion rolls add an extra dice (7) per unit to simulate the poor state of the defence in places. Apart from depletions there is no pre-battle phase for this game. The Germans have 450 points to spend, whilst the British have 620. No tanks were used in this action as only about forty were available for the entire operation and crossing the canal would have been problematic for them anyway, so the British can't choose them in their lists. However the BEF had fully integrated Lewis Guns into their platoons by 1918, so the British attackers get the LMG bonus (and extra cost) of an extra dice in the attack. The accounts speak of large amounts of German HMGs, so keep this in mind when buying German units! Victory conditions for the British attackers are to capture all the canal crossings (use the canal rules in Square Bashing) and the village of La Folie. Canal crossings are only captured when the two squares above and below each crossing are clear of enemy. All four objectives have to be captured, if less than four but more than one are captured the game is a draw, any other result is a German victory. When we get a chance to play this scenario, I will do a full AAR, but feel free to use the map for your own games! Very nice, thats on the list to do! Thanks, I am glad you'll be able to use it! Great idea for a scenario. I'll bite my toungue on the price of academic history books but thanks for posting the PhD link. Thanks, yes the books can be pricey, but the Changing War book is worth every penny IMO. Alternatively check your local university library, most offer a visitor's pass. I'm looking forward to seeing the after action report. I've only recently become aware of Square Bashing, so it's nice to see example games. Thanks JTW, I'll post the aar when we play it. Have a look through the other posts on this blog, there are loads of SB AARs. If you're on a computer click on the SB tags on the right hand side of the page. Anything I can do to get people playing SB!